Alicia and Adam Rico, each with a degree in painting, share a passion for flowers. “We’re on the same page, pretty much always,” says Alicia. In the foyer of a Highland Park home decorated by Cathy Kincaid, open petals of ‘Coral Charm’ peonies have a gradation of color, which the duo prefers as opposed to materials in saturated hues that look “straight out of the tube,” says Alicia. When two painters met in a chance encounter at a restaurant in Brooklyn, they never would have imagined that they’d fall in love, get married, and have two beautiful daughters. And they certainly wouldn’t have foreseen teaming up deep in the heart of Texas to foster a movement that would involve switching their artistic medium to flowers. Today, the couple owns Bows & Arrows, a floral-and-events firm known for its lush, over-the-top designs that leave quite the impression. With a big-as-Texas following in the wedding industry, they create flowers for nuptials in the Lone Star state as well as in far-flung locations from Thailand to Puerto Rico. No surprise that there’s plenty of Bows & Arrows buzz around town. “Their work is just gorgeous,” says interior designer Cathy Kincaid, who decorated the circa-1921 Highland Park house in which the arrangements for this story were photographed. 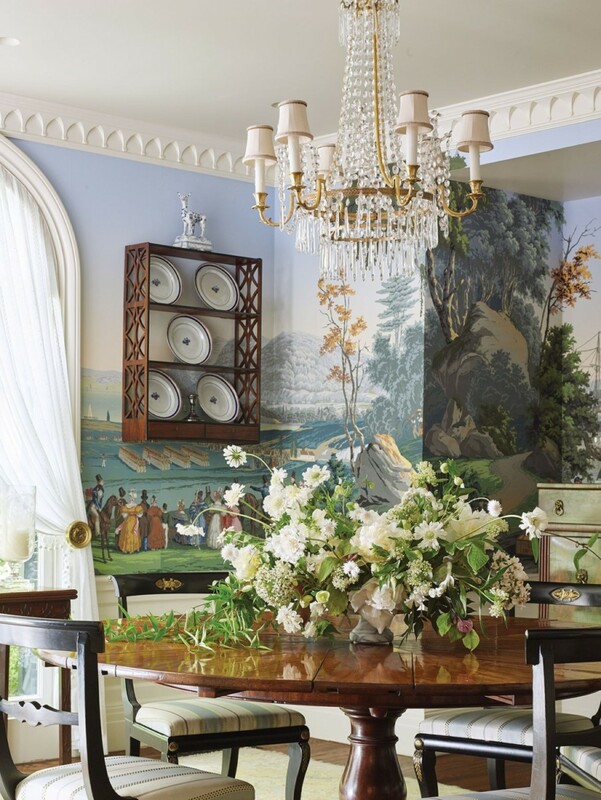 Kincaid’s richly layered rooms share a lavish sensibility with Bows & Arrows’ arrangements. “I love that there’s so much detail in Cathy’s design, from the wallpaper to the hardware, and I think our work is heavy on the details, too,” says Alicia. “When we opened Bows and Arrows in 2009, we wanted to bring a gardenesque, organic perspective to the area,” says Alicia. Indeed, every Bows & Arrows arrangement has a just-plucked-from-the-garden look, perhaps belying that each and every element is meticulously selected and carefully placed. The Ricos’ art backgrounds continually shape their aesthetic, especially when it comes to color. When choosing flowers, they try to steer clear from “straight-out-of-the-tube” colors, as they call them. Anything with a palette that fades is preferable, such as the subtle gradations on the petals of an open peony. While they both forage and condition materials, Alicia typically makes all of the smaller arrangements and Adam handles on-site installations and the building of structures. Having mastered how to work in tandem at home, office, and wherever their flowers take them, the duo encourages and critiques one another along the way. The tiniest leaf or petal, direction or curve is not off limits. “Most of the time we can read each other’s mind,” laughs Alicia. And, ultimately, each creation reflects the shared vision of two painters who are definitely leaving their mark on the world of flowers. 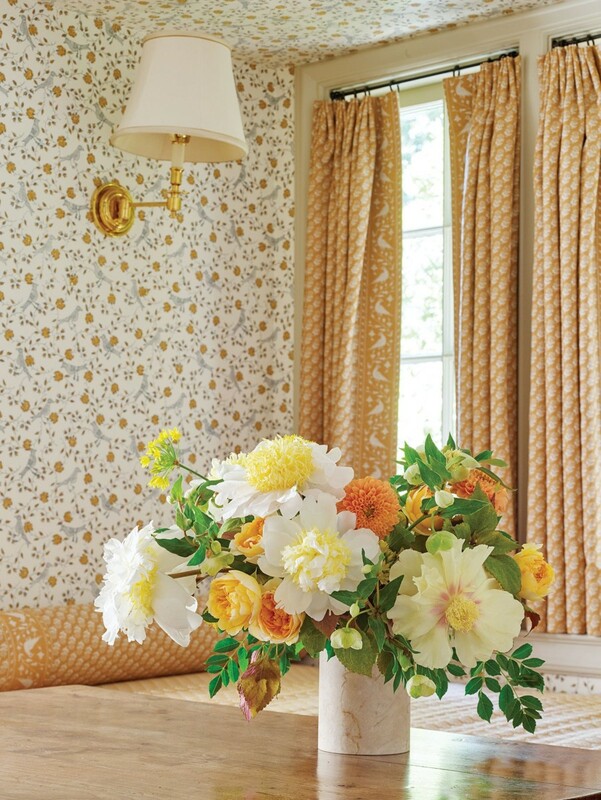 Golden tones in Pierre Frey Bengali wallpaper and Lisa Fine Rambagh and Baroda II fabrics are mirrored in a sunny arrangement of peonies, dahlias, alliums, hellebores, and ‘Beatrice’ garden roses. On an antique Jupe dining table, white scabiosas dance in an arrangement that includes hellebores, alliums, and trailing Carolina jasmine. The color scheme is fitting for a room enveloped in the rural scenes of colonial life in Zuber’s Views of North America. Overhead is a Regency crystal chandelier from the 1820s. 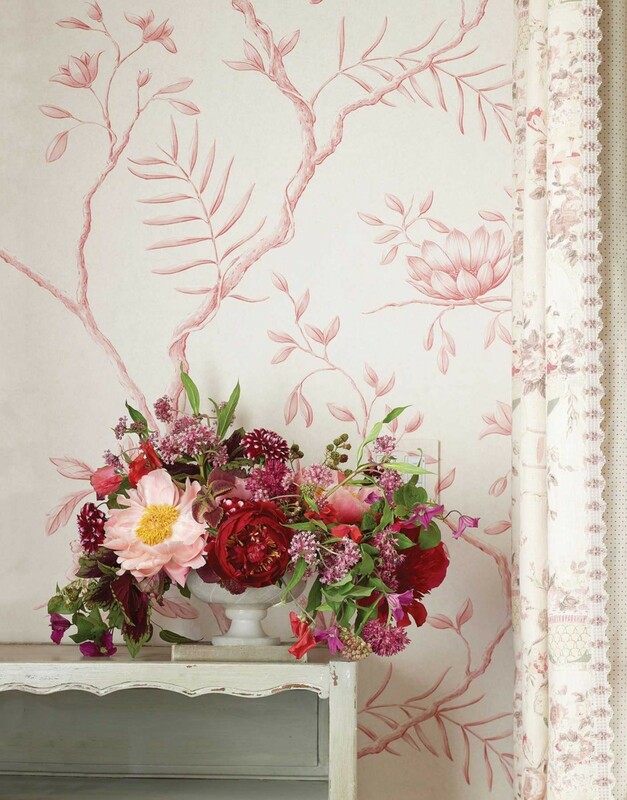 ‘Buckeye Belle,’ ‘Red Charm,’ and ‘Coral Charm’ peonies are a living reflection of the blooms in the Jasper Peony wallpaper by Carleton V. The drapery fabric is Gallica by Colefax and Fowler. 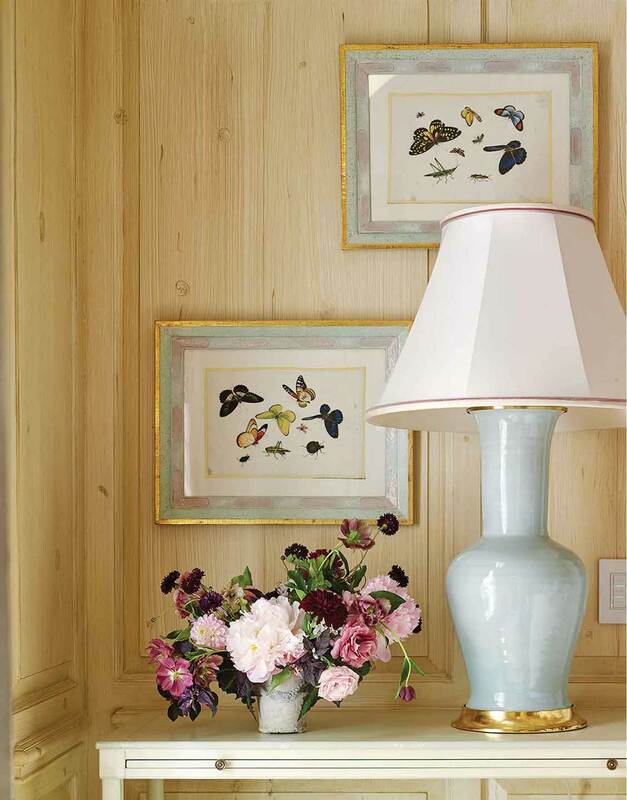 An arrangement of blush-colored peonies and lisianthus among purple and mauve hellebores, cornflowers, and coleus lends a moody effect to faux bois–painted corner with a John Rosselli bedside table, lamp by Christopher Spitzmiller, and butterfly art from Kenneth Neame.